Wanda Shum Design: 2008 Froggy! Well, I'm feeling I'm on a roll with making teapots lately. 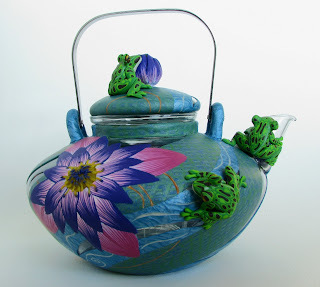 While I was working on the previous RetroLady teapot, a frog teapot was brewing and here's the end results! It was done on these brand new glass teapots I found at the last wholesale gift show I went to. They're very lightweight but withstands alot of heat. 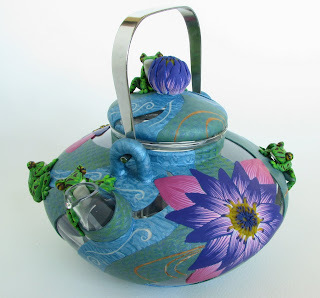 Unlike previous glass teapots, these come in a variety of styles that have inspired me. 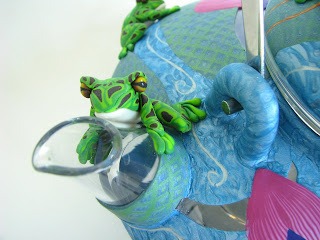 Like all the other teapots, most of the details are caned including the sculpted frogs. You can see more views of the teapot on my Flickr. 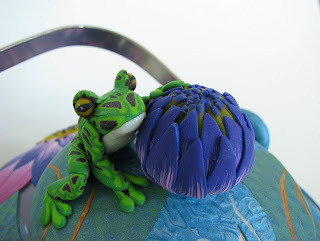 Love, love the Frog Teapot. This teapot was sold at a show this xmas season!